In 1919, the South Park Commission held a design competition for what was originally envisioned as a central gathering place "for events and a playground for the people." The architecture firm Holabird & Roche won the competition and designed a U-shaped stadium in neoclassical style, complete with matched Doric colonnades that opened on October 9, 1924 as the Grant Park Municipal Stadium. Its sobriquet was changed one year later to honor soldiers lost in World War I. The ceremony to mark the change was held on Armistice (now Veterans') Day and began with a firing of guns at sunrise, a 21-gun salute at 11 a.m. aside from the parades and ceremonial flag-raisings. Though it opened in 1924, the stadium wasn't completed until a third phase of construction concluded in 1939, giving it an ultimate capacity of 74,280 bleacher seats constructed out of fir planking. For special events, additional seating could be added to the end zones bringing the stadium's potential audience capacity to somewhere in the range of 100,000 attendees, though even that figure was occasionally topped by a special event. Today, Soldier Field remains one of the few stadiums still standing from the storied "Golden Age" of sports. The stadium was designed for flexibility, and it hosted everything from visits by heads of state, to football games, boxing matches, stock car races, and even ski jump competitions. Its pre-Bears history is rich: the Monsters of the Midway didn't even move in until 1971. The event featured a formal dedication and official opening with a mock battle, a horse-riding exhibition from the U.S. 14th Cavalry, and a re-enactment of the fire complete with a cow kicking over Mrs. O'Leary's lantern. Ten firemen who had actually fought the great fire used the city's first pump engine against the mock blaze in which a replica O'Leary barn was burned down. Some variation of this event was held there until 1970. One of the earliest notable events was the boxing match between heavyweight champion Gene Tunney and former champion Jack Dempsey on September 22, 1927. The fight was a rematch from the previous year when Tunney defeated Dempsey, the favorite. The rematch drew a gate of $2,658,660 ($22 million today) and set a simultaneous record for the first $1 million gate and the first $2 million gate. The fight has gone down in history for a controversial decision by a referee in the seventh round when Dempsey knocked Tunney down but the referee didn't begin the count until Dempsey had moved to a neutral corner, allowing Tunney extra time to recuperate. He went on to win the fight and spoil the hopes of many betting fans including, according to rumor, Al Capone. Several years later, a war show celebrating the two hundredth anniversary of George Washington's birth was held June 24, 1932. It was an 11-day event opened by an 8 p.m. flyover by four squadrons of fighter planes (perhaps anticipating the Air & Water Show) escorting Amelia Earhart in a plane painted to resemble a red and white eagle. Earhart joined the famous who addressed crowds in the stadium when she later arrived to address and medal and recount her 1931 flight across the Atlantic Ocean to the crowd. For some reason in 1947 auto racing in the field became popular. Both midget and stock car races were held within the field for years to come. President Harry Truman made a trip to Soldier Field on June 19, 1949 to preside over the event marking the 75th anniversary of the Shriners, the first event at the stadium ever to be televised. The big anniversary celebration included one of the largest parades in the city's history, with 15,000 members of the fraternal order from 1,000 chapters and 130 bands. The parade covered three miles and lasted five hours culminating at the field. But perhaps the largest event ever held at the field was the Marian Year tribute of the Roman Catholic Archdiocese of Chicago. It's estimated that 180,000 attendees were inside the stadium itself while another 80,000 listened outside on loudspeakers. Civil rights leader Dr. Martin Luther King, Jr. led a Chicago Freedom Movement rally at the field June 21 1964 that drew 75,000. In 1971, the Chicago Bears could be found playing games at Wrigley Field (home of the Cubs) but when the AFL and the NFL merged, new rules required fields that seat over 50,000. They'd originally intended to build a stadium in northwest suburban Arlington Heights but settled on moving into Solider Field instead. Some renovations were required first, including new end zone seating on the north which created a separate "North Field" section, which would later go on to host tennis tournaments. The Bears extended their lease with the Chicago Park District in 1978 for another twenty years, and began replacing Soldier Field's old plank seating with more modern stadium seating. The field was imperiled when, in 1989, a proposal was made for a newer, domed stadium that would be built on the site. The Bears announced that it would consider moving to Indiana, and even purchased options on sites in suburban Aurora and Hoffman Estates to show the city that it was serious about leaving. The state legislature ultimately rejected the move. Following the 2001 season, Michael McCaskey threatened to move the Chicago Bears unless Chicago put up money to renovate Soldier Field. Still pissed I can’t watch my Bears at home in Alaska. 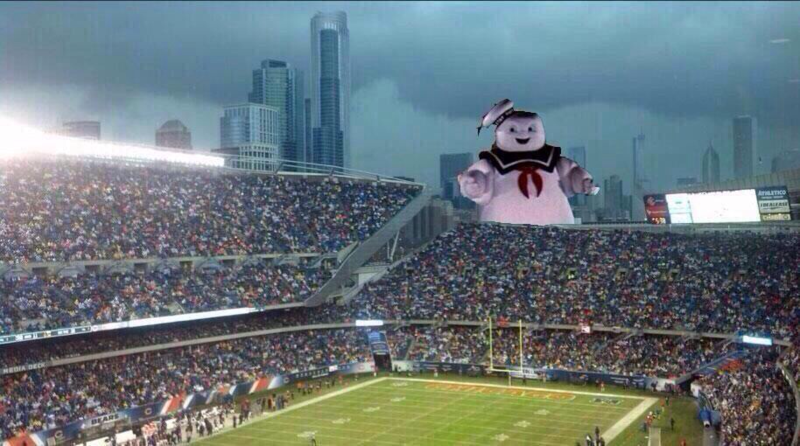 Phillips saved the day and was rewarded with a promotion to Team President/CEO for working out a deal with the city to update Soldier Field and keep the Bears from moving to Indiana, Michaels plan. If you have ever been to East Chicago, Indiana you would know why this was such a big deal. So Michael thought hey, we will just move over the border and still be called the Chicago Bears. I do not think Michael had ever been there before. It is one of those plans that look great on paper, but in reality is destined to fail. Also, the added probability that instead of "Lunch with Larry" we could enjoy "Brunch with Cal" on the CBB! We are getting the field ready. 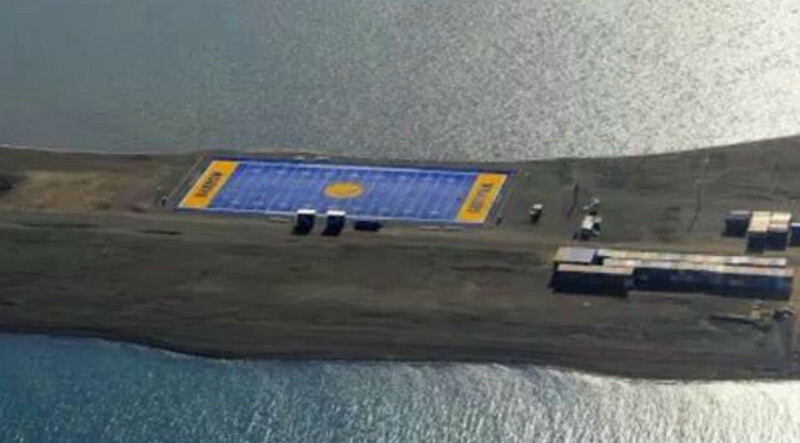 Problem I see with that field is, with Punter O'Donnell re-signed for two years, you will need two boats on duty every home game, to retrieve shanked punts from the water! The Chicago Cardinals used it as their home field for their final season in Chicago in 1959. A dozen years later in September 1971, the Chicago Bears moved in, originally with a three-year commitment. They previously played at Wrigley Field, but were forced to move to a larger venue due to post-AFL–NFL merger policies requiring that stadium capacities seat over 50,000 spectators. In 1978, the Bears and the Chicago Park District agreed to a 20-year lease and renovation of the stadium. Both parties pooled their resources for the renovation. The playing surface was AstroTurf from 1971 through 1987, replaced with natural grass in 1988. The former South Park Commission (the Commission merged with 22 other park systems to establish the Chicago Park District in 1934) hired Chicago architects Holibird and Roche in 1919 to design a stadium that would serve as a showcase “for events and a playground for the people.” On October 9, 1924, the Grant Park Municipal Stadium premiered and one year later, at the request of the Chicago Gold Star Mothers, the stadium was renamed Soldier Field. It was known as one of the great venues during the "Golden Age of Sports" and one of Chicago's most famous landmarks. Crowds in excess of 100,000 were commonplace, marked by several memorable events including the 1926 Army-Navy game and the epic 1927 Jack Dempsey/Gene Tunney heavyweight rematch featuring the controversial "long count". In 1944, 150,000 spectators attended a wartime visit by President Franklin Roosevelt and thousands turned out to hear evangelist Billy Graham in 1962. Soldier Field is also the birthplace of the first Special Olympic Games in 1968. College and Professional football, rock concerts, festivals, rodeos, stock-car races, and even a skiing/toboggan event have called Soldier Field home. The Chicago Bears moved from Wrigley Field and began using the facility in 1971 and played their first game in the renovated Soldier Field on September 29, 2003. 1919 - Plans for the stadium began in 1919, when Holibird and Roche won an architectural competition to build the stadium as a memorial to American soldiers who died in wars. 1922 – 1928 - The stadium was constructed by the South Park Commission (which later merged with other park commissions to become the Chicago Park District in 1934.) Soldier Field is a monument to the times and great sports places typical of the “Golden Age of Sports” and is one of few such stadiums still standing. Soldier Field was built in three stages between 1922 and 1939 at a total cost $13 million. Soldier Field, when completed, contained 74,280 permanent bleacher seats made of fir planking. An additional 30,000 spectator temporary bleacher seats could be placed along the interior of the field, upper promenades and on the large open terrace beyond the north end zone. October 9, 1924 – The official opening day – which coincided with the 53rd anniversary of the Chicago Fire—of the Municipal Grant Park Stadium. Within a year it was renamed Soldier Field. The first event held in Soldier Field was a police meet featuring 1,000 police athletes and reportedly drew 90,000 spectators. Crowds in excess of 100,000 became commonplace in the years that followed, marked by several memorable sporting events. November 22, 1924 – First football game held at the Municipal Grant Park Stadium was Notre Dame (13) v. Northwestern (6). November 11, 1925 – The Municipal Grant Park Stadium is officially renamed Soldier Field at the urging of Chicago’s Gold Star Mothers. November 27, 1926 – Soldier Field was officially dedicated in front of a crowd of 110,000 during the Army v. Navy game. The game ended in a 21-21 tie. September 23, 1927 - The epic Jack Dempsey/Gene Tunney heavyweight rematch featuring the controversial long count with 104,000 watching. Dempsey knocked down Tunney and Dempsey went to the wrong corner. The referee directed him to the right corner, and five seconds passed before he started counting out Tunney. Tunney, the champ, got up at nine, which should have been 14, and went on to beat Dempsey. 1927 – The largest crowd to watch collegiate football was 123,000 to see Notre Dame take on Southern California. 1937 – The largest crowd to watch a high school football game took place at Soldier Field with an estimated 115,000 watching the Austin v. Leo High School Prep Bowl football game. 1944 - 150,000 spectators attended a wartime visit by President Franklin Roosevelt. 1948 – Chicago Park District engineers won an award at the 1948 International Lighting Expo for their design of a stadium lighting system featuring 5,000 watt flood lights that could be arranged in pre-set patterns by a three man crew. 1954 – 260,000 came to Soldier Field for a Catholic celebration entitled the Eucharistic Congress. 1962 - 116,000 turned out to hear evangelist Billy Graham. September 19, 1971 - The Chicago Bears began using the facility as a regular season home and capacity was cut to 57,000 to bring season ticket holders closer to the field. Chicago defeats the Pittsburgh Steelers 17-15 before capacity crowd of 55,701 in the Bears’ first game since moving from Wrigley. 1978 – With the Chicago Bears, the Chicago Park District began to reconstruct the aging stadium with lights, playing surface, locker rooms, and rebuilding the stadiums’ plank-board style seating with chair back and armrests. 1981 – With renovations complete, Soldier Field could welcome 66,950 visitors. September 1988 – Soldier Field converts turf from AstroTurf to Kentucky Bluegrass. 1994 – Soldier Field hosts the opening ceremonies of the 1994 World Cup soccer play, the first time the competition will by played on American shores. 2003 - Soldier Field completes a 20-month renovation that modernized the stadium and surrounding parkland for multi-purpose event use. The stadium grounds now host over 200 event usage days per year. 2011 - Soldier Field is awarded the status of LEED-EB from the United States Green Building Council (USGBC). Soldier Field is the first existing North American stadium to receive the award of LEED-EB Certification and the first NFL stadium to receive this prestigious award. LEED-EB stands for Leadership in Energy and Environmental Design – Existing Building. 2014 - Soldier Field hosted the New Zealand All Blacks rugby team as they faced off against the USA Eagles on November 1, 2014 marking the All Blacks first match in the US since 1980. The All Blacks defeated the Eagles 74-6 to a sold-out crowd. 2015 - Soldier Field hosted the final concert performances by legendary American rock band the Grateful Dead on July 3rd, 4th and 5th in celebration of the band's 50 year history. More than 212,000 Deadheads rocked out at Soldier Field for the Fare Thee Well shows over the holiday weekend, shattering stadium attendance records. 2016 - Copa America Centenario, in celebrating their 100th-anniversary edition of the South American championships, selected Soldier Field to host four matches: Jamaica vs. Venezuela (June 5th, 2016), USA vs. Costa Rice (June 7th, 2016), Argentina vs. Panama (June 10th, 2016), and the Semi-Final between Chile and Colombia (June 22nd, 2016). Soldier Field has hosted rock concerts, thrill shows, rodeos, tractor and truck pulls, circuses, fireworks displays, stock car races, sunrise services, marching band concerts, open-air operas, skiing and toboggan events including a ski jump event from a 13-story platform. The stadium’s underpinnings consist of 10,000 giant wood piling foundations driven an average depth of six stories through landfill to bedrock. It hosted the first boxing event that drew a gate of over $2.5 million (Dempsey-Tunney, 1927), the first ski meet held in a stadium, and the all-time largest football crowd (123,000). The largest crowd for any event in Soldier Field was 260,000 on Sept. 8, 1954, for the religious Marian Year Tribute.